Update: 11th Feb 2015 : See working BeMicro-Max10 files here. I started on a P1V image today for the BeMicro MAX10 board and I've hit a wall. A rough estimate suggested 4 cogs could fit into the 10M08DAF484C8GES Max10 device. (8000 LE's). This included the removal of the lower rom stuff (tables,fonts) like the DE0-Nano build. 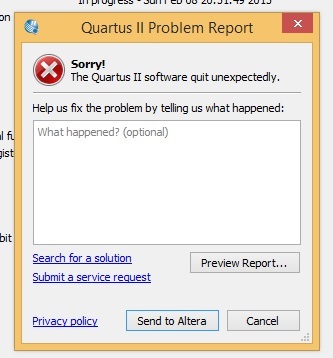 Quartus II 14.1 reported problems fitting the image with the following details. By removing the ram loading stuff in hub_mem.v file has a dramatic effect on LE usage. Is their another way to initialize the ram with an image or is this result indicating that the MAX10 cell design is consumed by ROM emulation. The obvious answer is probably a defective "ME", but any other suggestions would be a great help. Is it something to do with trying to stuff the code into the ALMs rather than the flash memory of the device? Want me to post your Max10? "You can turn on the Enable ERAM Preload option in the More Analysis & Synthesis Settings dialog box." [" Title : Where can I find the "Enable ERAM Preload" option for MAX 10 devices in the Quartus II software version 14.1 and later? I think that Altera answer is newer then the Blog, so it may help. Just tried one of Altera's suggested settings....failed! The good new is both suggested settings removed the problem of LE usage. The bad news is I now blow out on the memory bits budget. I had to reduce to 3 cogs now for some reason, but building for 1 cog still exceeds memory bit limit. It looks like a larger Max10 is needed to accommodate a P1V. The LE per cog changes from 7,415/4 = 1853.75 to 6,374/3 = 2124.66 - a 15.6% rise ? RAM usage has also elevated by 14336 Bytes, but that should be mapped to HUB + N 8 COG memory. I've not tried Quartus 14.1, but sometimes tools give more lucid info, on a Build that worked, than one that failed. Some trade off of ROM features and RAM will be needed, initially. 2048 Bytes should be enough for a Loader ? The Max10 has 176128 Bytes of FLASH, with parallel interface options, so rather than Initialised-RAM, Flash could be mapped. The Flash speed is slower than RAM, and burst orientated, so that will need some work. A reduced RAM with minimal ROM Loader should give a testing base ? Interesting. The increase in memory usage is 8192 + 3 cogs * 2048 bytes. Is that 8192 the rom size? I've taken a step back to 14.02 and the problem now is I need a Max10 qdz file to match. The Altera site only seems to have a 14.1 version available. The upgrade from 14.0 to 14.02 does not include this file. The device installer only recognizes 14.0 files. Has anyone successfully added Max10 devices into 14.02 ? Sounds like work - did you try lowering RAM ? That's a large ROM, what bumps the size ? Reducing the HUB ram size is next on my to do list. Do you think my answer should be "How the hell do I know!" Ok things are looking better now. I gave up on Quartus 14.02, nothing but heartache there. Nice progress. The extra RAM avail is not much, so could be better to do some 'signs of life tests' instead ? ie Does it run, and how fast ? There may be a way to drop the ROM size to just the [interpreter and loader] value of 0xffff-0xf002 = 4093, or even further, to Loader alone. On paper, that depends on the ROM handling chosen . However, there is a LOT of User Flash with a Parallel burst read ability, that may be able to be used for most ROM tasks. Certainly, it can have many COG images and the Logic or even an Opcode to Load Page from Flash would open this. The timing diagrams show a Address and Burst Count of up to 128 x 32 reads, but I cannot see if there are any boundary caveats on that address ?. If the Burst read takes any starting address and feeds up to 128 words, then that is easy to use. Even if those reads have to be on 128 word boundaries, it is still useful. lower 9 bits as Dest Address if COG, or lower 15 ?? BITs if HUB destination. Looks like 1 can be used for single word reads, but 3,5,6 seem invalid ?, and the timing suggests pair-gets ? An example gives 6 Count, so maybe that's a typo ? The exact handling of Flash Reads varies with Chip part code. I think a 10M08 can read 128 x 32 bit words in (5+128*2)/116M = 2.25 us, which is a pretty nimble task switch, or Function call. It looks like you may be able to use the Avalon-MM IP Core to expose the User Flash Memory as read-only memory. If that's the case, the BeMicroMAX10 appears to have 8K of flask, which should then be usable as 8K of ROM. That should at least be enough to add the boot rom and spin interpreter, right? See MAX 10 User Flash Memory User Guide for details. And if this is correct, this would be a rather neat way to implement a P1V. You would program the MAX10 with the core, keeping the entire ROM in UFM. Then the "ROM" could potentially be modified without having to touch the verilog. If that's the case, the BeMicroMAX10 appears to have 8K of flask, which should then be usable as 8K of ROM. That should at least be enough to add the boot rom and spin interpreter, right? The Flash has a readdatavalid signal, so it should need a fairly simple state machine. Correct, but Flash PGM from User code is a little more work. There is also a speed penalty for Flash reads over RAM reads, but for many (most?) apps that would not matter. Using the BurstCount should reduce the impact of the Flash latency. Yup, which is why my calculation used 9 bits. The '9 bit effect' means the tools will still report some Memory Free, even when all available bytes are taken. FYI. I was able to build a 6 Cog 32K HUB image for a 10M16. Ok, that'd suit me nicely. Thanks for checking that. The BeMicroMAX10 uses the 10M08DAF484C8GES. According to Mouser and Arrow's BeMicroMAX10 details, that particular version has 256Kb. I believe the 1376Kb is the maximum available in a 10M08 package, Based on the MAX10 overview document, the 1376Kb also includes the configuration flash (though the User Flash Memory User Guide states differently). Of course, the "ES" at the end of the part number also means "Engineering Sample", so it might very well be that there's a bit less UFM than will be available in full production chips. Edit: to make it even more complicated, if you select the device in Quartus, it states that the maximum UFM is 2555904 bits (2496Kb, 312KB). Interestingly, though, the User Flash Memory User Guide states that the Configuration Flash Memory is 2240Kb. If you add 256Kb to that, you get 2496Kb. Here's my guess: the overview document is wrong, as is the UFM column in the UFM User Guide. The actual total amount of flash is 312KB, split into 8KB of UFM and 280KB of CFM. Check out table 4 in that overview doc Seairth, where it indicates 378 Kb of M9K memory.
. According to Mouser and Arrow's BeMicroMAX10 details, that particular version has 256Kb. .
256kb is 32K Bytes ? Altera DOCs do look very conflicted and confused. You wonder if anyone bothers to read them before release ? There are some interesting things you can do with a P1 with less cogs but more pins - eg a touchscreen with the ability to rapidly dump a megabyte of data out to the screen for fast text refresh in any font. The P1 never seems to have quite enough pins for that. And maybe 8 cogs are not needed - I suspect a VHDL/Verilog UART may take less elements than a cog running UART code. There seems to be a thread every few weeks about what the P2 should look like - much more fun to actually be building things and testing them out. I am watching this thread with interest (and some degree of guilt, as I have one of these BeMicro boards sitting in the Man Cave on the 'to-do" projects list). With 16K hub ram in the Max10 P1V, a modification is needed to inhibit writes to upper 16K of hub overwriting the lower 16K. This modification is required to allow the loader to work.